It can be intimidating for a young professional starting her career to speak up and express her ideas to management. But Angela Wnek ’13 brings a lot of confidence to the conference room. 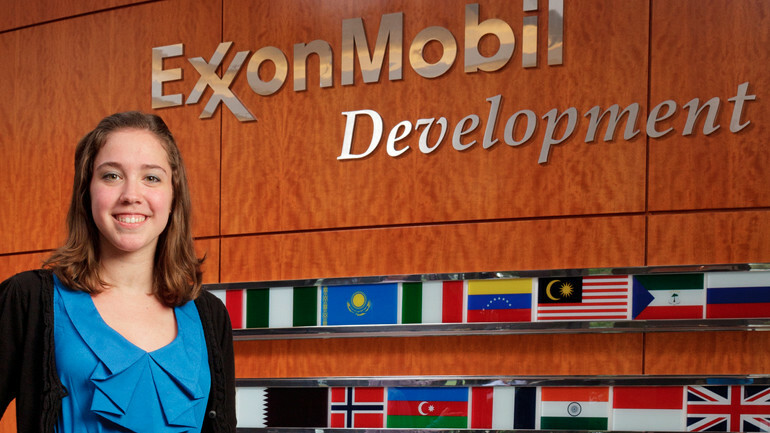 A business analyst for ExxonMobil in Houston, Texas – a position she secured after a successful summer internship with the company – Wnek is tasked with explaining complicated data in a simple way. Thanks to her chemical engineering degree, Wnek has the know-how to break down the data, but it was her passion for forensics that instilled in her the confidence to contribute in meaningful ways. Wnek notices that she feels more comfortable than her peers in similar positions when communicating with management. Those intangible skills are crucial. She could have all the engineering knowledge in the world, but if she can’t communicate it effectively, it’s of little use. Wnek’s passion for speech began in high school when a friend suggested she join the team. Not ready to give it up when she got to college, she joined Lafayette’s Forensics Society, where she quickly made her mark. Wnek would go on to win three individual state championships in dramatic interpretation, poetry, and persuasion, and was one of just two Pennsylvania students to compete on the national level the same year. And that improvement wasn’t just limited to speech. She saw improvement in her engineering courses, too. Wnek asked more questions and was able to explain her parts in labs more clearly. That improvement is an ongoing process, says Wnek. In addition to conducting nanotechnology research through the EXCEL Scholars undergraduate research program, Wnek also completed an independent study project to explore speech instruction. She learned how to teach and coach effective communication and presentations and mentored fellow students on their speech class assignments.